HTPC builds require not only a heat sink with a physically smaller dimensions, but one that performs silently. Small fan size generally means the exact opposite due to the higher RPM requirement just to produce as much airflow as a larger fan size equivalent, so finding the balance is always an issue that many heat sink manufacturers have tried to tackle. Smaller motherboards also pose clearance issues in terms of compatibility with larger aluminum arrays preventing RAM, expansion card installation and plugging in cables. Understandably, many heat sink manufacturers don`t even bother to offer any HTPC heat sink solution due to these design requirements if the smaller profit margin due to the niche target and low price wasn`t enough to discourage them in the first place. There are some companies such as Noctua however who specialize in cooling, so the challenge of creating a perfect HTPC heat sink is something they do not run away from but rather run towards enthusiastically. 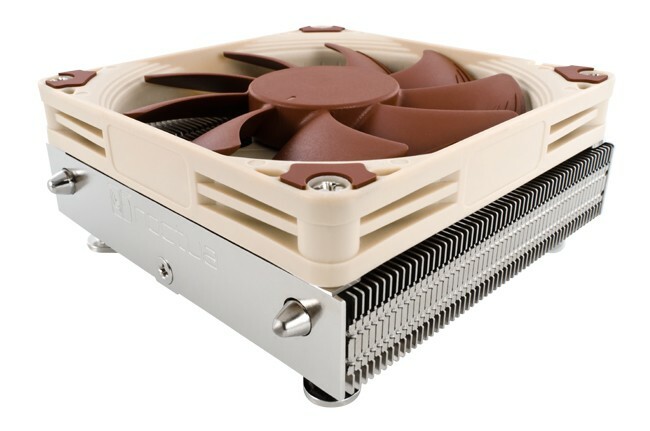 While Noctua has the 66mm tall NH-L12 HTPC cooler, many users are clamoring for an even lower profile cooler that can fit under 1U form-factor requirements. Rack units or RU is the standard height measurement used for electronic or network equipment. One rack unit or 1U measures 44.45mm (1.75 inches) tall, two rack units or 2U is twice that 88.9mm etc. A sharp contrast compared to Noctua’s flagship NH-D14 cooler’s size, the NH-L9 series’ 37mm height makes them ideal for mini-ITX HTPC use. The 37mm is the total height which includes the 14mm-tall Noctua NF-A9x14 92mm fan. The NH-L9 series comes in an Intel version designated as “NH-L9i” that compatible with LGA115x mainboards while the AMD version is designated as “NH-L9a” which is compatible with AM2(+), AM3(+), FM1 and FM2 mainboards.